Oceania bills itself as the world’s largest upper premium cruise line and claims to offer the "finest cuisine at sea." After sailing Oceania’s Riviera I must agree -- the food was divine. While the Riviera is a beautiful ship with superb service, the highlights of my ten days at sea all involve food. It always takes a few days on a new cruise ship to find your way around. What’s the best place for morning coffee? What time do the breakfast venues open? Which lunch options to choose? Is one dinner setting better than another? Oceania offers many choices; the following, except the cooking school, at no extra charge. I love early morning coffee and enjoy watching the sun rise. It took a few days to discover that the Terrace Café, the ship’s buffet restaurant, has wicker tables outside with cushions and when the weather cooperates, it’s a lovely place to greet the morning. Some days I brought my book and stayed, eating breakfast al fresco. When early port days necessitated a quick breakfast, room service, available 24 hours a day, provided the best alternative. On sea days, it was lovely to eat a multi-course breakfast in The Grand Dining Room. Both the Terrace Café and The Grand Dining Room offer unlimited lattes and cappuccinos and a wide variety of fresh fruit. I was particularly fond of their fruit salad; finely diced so small it resembles a mosaic. Lunch options are so plentiful, why wait until noon? Once I found the Waves Grill, the ship’s answer to pool-side dining, I was hooked. Located in a glass enclosed shaded area, how to choose between an array of hamburgers, veggie burgers, salmon burger, paninis, and chicken? And don’t forget the addictive French fries. Lighter options include hearty salads; this was my choice when indulging in dessert, such as gelato, ice cream sundaes, milkshakes, or fresh smoothies. An afternoon tea lover’s dream is available daily from 4:00 p.m. to 5:00 p.m. It’s a formal affair with beautifully set tables, warm scones with cream and preserves, and an amazing array of tea sandwiches, pastries, and cakes. Dinner choices were so plentiful. There are four specialty restaurants on the Riviera. Toscana is an elegant Italian restaurant and the Polo Grill a classic steakhouse. Both are like special occasion restaurants you might visit at home. Stellar choices are Jacques, the first restaurant to bear Jacques Pepin’s name and Red Ginger, a unique take on Asian classics in a stunning setting. The Grand Dining Room is beautiful and offers different selections daily. For a casual dinner, I enjoyed the Terrace Café. The tables are set with tablecloths at dinnertime, making it a lovely, casual option. Weather permitting, how special to dine al fresco under the stars. The Riviera boasts a cooking school, fee required, offering hands-on instruction. I took the two-hour Fish Master Class where I learned to prepare five types of fish. I not only picked up new cooking techniques, but got to eat the fruits of my labor. I’d be remiss if I did not mention the bread. They bake it all day long and I have never had such delicious bread. While the Oceania has many merits, their unique food venues and meals are a stand-out. I can’t wait to be back onboard. 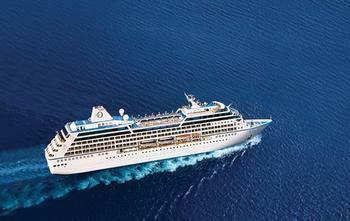 What’s it like to sail Celebrity Cruises? Cruise ship specialty restaurants – are they worth it?